Tenor William Burden, pictured at the far left, plays George Bailey in the new production. In the film and the opera, the story is the same. Both look at the life of George Bailey of Bedford Falls: his dreams, his love, his crushing disappointments which bring him to the brink of suicide. "In the end, it's really such an operatic story," Scheer says. Composer Jake Heggie says they had to put the iconic Frank Capra film as far behind them as they could. "You internalize the material: You love it, you memorize it, and then you forget about the original source," he says. The goal, he says, is to "honor the source by doing something fresh and new — while still telling that story." For starters, the angel named Clarence — who saves George Bailey in the movie — becomes Clara. And instead of just coming to save George, the angel needs to uncover essential truths about George's character as part of her mission to earn her wings. "Clara is able to access all the days of George's life and, one by one, she pieces together, slowly, the story," Scheer says. Perhaps because of the part's evolution, Talise Travigne, who plays Clara in the opera, won't be too easy to compare to actor Henry Travers, who played Clarence in the movie. But tenor William Burden, who plays George Bailey, is up against the even longer shadow of Jimmy Stewart. Burden knows he isn't Stewart. "Nobody could be!" he says. "And I don't think anyone would even want to be. That is a remarkable performance. And so, what I am hoping to do is to take this treatment of this wonderful story and bring it to life in the best possible way that we can." Perhaps the most surprising choice Heggie and Scheer made was to eliminate music entirely from the most climactic moment of the piece, in which the angel shows George what life would have been like if he'd never been born. 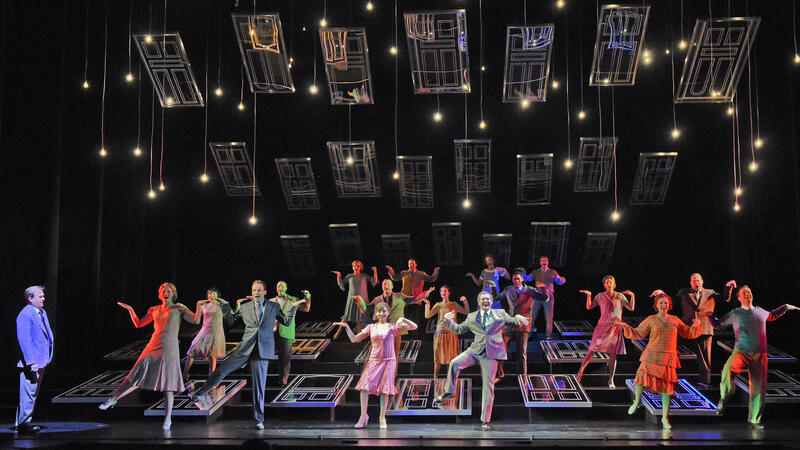 "It is an opera, and the idea that the world without George Bailey is a world without music seems to be a beautiful way of depicting it," Scheer says. Heggie says George's realization — that the world is indeed a better place because of his existence — is relatable for the story's audience. "I think it's information that all of us can connect with and understand," he says. "That's why it really is such a universal story." While many people are sure to catch the movie on TV this holiday season, they might not be able to make it to Houston for the opera. Not to worry: It will be back for Christmas 2018 in San Francisco — and perhaps for many more Christmases to come. If you love the holiday season and all its delights, you've probably already set aside time to watch Frank Capra's 1946 classic "It's A Wonderful Life." George Bailey's life-and-death struggle has it all - dreams dashed, attempted suicide, a compassionate angel. And all that drama is coming a little early to the stage of the Houston Grand Opera. That's right. An operatic version of "It's A Wonderful Life" opens tomorrow night. Jeff Lunden asked the creators why they decided to mess with such a beloved film. JEFF LUNDEN, BYLINE: Librettist Gene Scheer admits it was kind of a fool's errand. GENE SCHEER: It's almost secular scripture, this piece. SCHEER: It really is. Everyone knows all the lines. HENRY TRAVERS: (As Clarence) Every time you hear a bell ring, it means that some angel's just got his wings. LUNDEN: In the film and the opera, the story is the same - a look at the life of George Bailey of Bedford Falls - his dreams, his love, his crushing disappointments which bring him to the brink of suicide. SCHEER: It's really such a - an operatic story. UNIDENTIFIED SINGERS: (Singing) Goodbye, goodbye, goodbye, goodbye, goodbye, goodbye, goodbye. LUNDEN: Composer Jake Heggie says they had to put the iconic Frank Capra film as far behind them as they could. JAKE HEGGIE: What you do is you internalize the material. You love it. You memorize it. And then you forget about the original source so that you can honor the source by doing something fresh and new while still telling that story. HENRY TRAVERS: (As Clarence) You see, George, you reall had a wonderful life. UNIDENTIFIED SINGER: (As Clara, singing) Mustn't fail, mustn't fall, so I'm moving along waiting for the day I get my wings and fly away. SCHEER: Clara becomes the substitute for the audience. LUNDEN: Librettist Gene Scheer says he's reconceived the part so that rather than just coming to save George, the Angel needs to find out who he is as part of her mission to earn her wings. SCHEER: We came up with this notion of playing the story out in this sort of netherworld where Clara is able to access all the days of George's life. And one by one, she pieces together slowly the story. LUNDEN: If Talisa Travigne's Clara doesn't need to worry too much about the long cinematic shadow of the character she plays - Henry Travers was Clarence in the movie - tenor William Burden is up against Jimmy Stewart. WILLIAM BURDEN: I can't let myself go down the rabbit hole of - I am so not Jimmy Stewart, and nobody could be. JIMMY STEWART: (As George Bailey) What is it you want, Mary? What do you want? You want the moon? Just say the word, and I'll throw a lasso around him and pull it down. Hey, that's a pretty good idea. I'll give you the moon, Mary. BURDEN: That is a remarkable performance. So what I am hoping to do is take this treatment of this wonderful story and bring it to life in the best possible way that we can. BURDEN: (As George Bailey, singing) How about the moon, Mary? You want the moon? Say the word, and I'll throw a lasso around it and pull it down. LUNDEN: Perhaps the most surprising choice that Jake Heggie and Gene Scheer made is to eliminate music entirely from the most climactic moment of the piece - when the angel shows George what life would have been like if he'd never been born. SCHEER: The idea that the world without George Bailey is a world without music seems to be a beautiful way of depicting it and also to think about re-emerging when you want to live again. That music returns. LUNDEN: Operatic stories are often intimate tales played upon by much larger forces, says composer Jake Heggie. HEGGIE: The story really is how all these little events add up to a wonderful, meaningful life. And we can take them for granted and ignore them along the way, but they have mattered to someone. And in the end, that's what gives us this huge redemption at the end for George when he suddenly realizes what a difference he has made in all these people's lives and how the world is a better place because he existed. I think it's information that all of us can connect with and understand. And hopefully we've done a good job in putting it into a musical form as an opera. LUNDEN: And while many people are sure not to miss the movie on TV this holiday season, they might not be able to make it to Houston for the opera. Don't worry. It'll be back for Christmas 2018 in San Francisco and maybe many more Christmases to come. For NPR News, I'm Jeff Lunden. Transcript provided by NPR, Copyright NPR.